Everything You've Heard about Concussions is WRONG. - J. Steele Olmstead, P.A. Everything You’ve Heard about Concussions is WRONG. 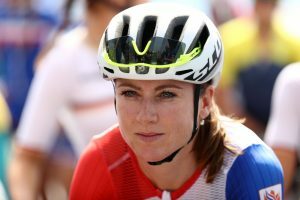 Annemiek van Vleuten was badly injury by an over the handle bars crash in the 2016 Olympics. 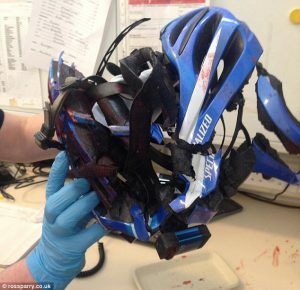 This helmet saved Ben Hobb’s life in 2015, but didn’t stop him from having a brain injury. Head trauma with subsequent injury to the underlying brain tissue with or without intracranial bleeding can be extensive and obvious clinically but can also be occult and difficult to diagnose even with the best of clinical Neurological and Psychological testing. in many cases, mild or subtle cases of TBI evolve into chronic traumatic encephalopathy (CTE). The Center for Disease Control in Atlanta Georgia states: “Chronic Traumatic Encephalopathy is a progressive neurodegenerative disease (tauopathy) caused by total brain trauma, and is not limited to athletes who have reported concussions. The typical signs and symptoms of CTE include a decline of recent memory and executive function, mood and behavioral disturbances (especially depression, impulsivity, aggressiveness, anger, irritability, suicidal behavior and eventual progression to dementia). The initial signs and symptoms do not typically manifest until decades after trauma received (ages 40-50). someone in their teens or 20s who suffers a severe brain trauma would not show noticeable signs of it for decades. Fortunately, new software called Neuroquant is available to the injured person who notices ssymptoms of CTE. Sometimes, it gets worse: a small subset of individuals with CTE develops Chronic Traumatic Encephalomyopathy (CTEM). This isa progressive motor neuron disease characterized by profound weakness, atrophy, spasticity and fasciculation similar to amyotrophic lateral sclerosis (ALS). CTE is responsible for significant interference with the activities of daily living. The CT scan that a Hospital emergency department orders is useless for these types of traumatic brain injury. Even the usual MRI ordered by a concerned family physician will not likely show damage to the cells in case of a traumatic brain injury. A family physician usually spacedoes not know which is the proper MRI test to order. There are several different kinds. While even the best quality Neuro-anatomical structural imaging may still not uncover responsible brain pathology, newer functional brain MRI techniques on the 3.0 Tesla scanner promise to be more successful. 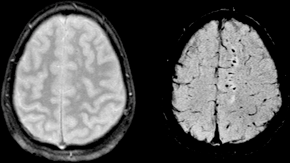 Of particular utility are the functional BOLD 3.0 Tesla MRI sequences (VEN_BOLD SWI) which are as much as 4 -6 times more sensitive than gradient echo (GRE) T2* 1.5 Tesla images and twice as sensitive as 3.0 Tesla GRE sequences at detecting occult micro-hemorrhages in the brain which might be associated with axonal shear injury. Overall, the SWI sequences are roughly 6 times more likely than routine, non-susceptibility 1.5 Tesla imaging to detect old blood deposits in brain. Other MRI tests for traumatic brain injury include DTI and, the latest, Neuroquant. Take a look at the white spots in this MRI. Those spots are where the brain has suffered “Diffuse Axonal Injury” or DAI. These spots can be big or small. They are all pictures of the death of brain cells. It seems like you keep struggling and you’re not getting better and your doctor doesn’t understand or care or your loved one and friends can’t help. My clients have been where you are. I helped them recover too. I received a bachelor of science degree in Psychology with a minor in biology from Florida State University. The brain is our most important human organ. It can be badly damaged with what the emergency department or walk-in clinic calls a “concussion.” It’s not an injury to be taken lightly and it needs to be understood. It doesn’t go away. You recover, but you have a permanent injury which has to be properly evaluated and understood. The CDC has an entire page on this one injury alone because it is so important to us and our brains. I am a full-service personalized, personal injury lawyer with a statewide practice in all 67 counties. I have 31 years of experience to put to work for you. Call so I can answer your questions: 1-800 – 535 – 3002. 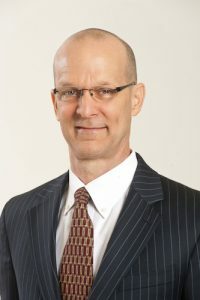 Email: JSteele@JSteelelaw.com Skype: ScienceCan Facebook: https://www.facebook.com/JSteeleLaw/ Twitter: @JsteeleOlmstead or @FlaBicyleLawyr Instagram: jsteeleolmstead. ¹1. McIntosh, Saatman, McIntosh, et al. Review. The Dorothy Russell Memorial Lecture. The molecular and cellular sequelae of experimental traumatic brain injury: pathogenic mechanisms. Neuropathology & Applied Neurobiology [serial online]. August 1998;24(4):251-267. Available from: Academic Search Alumni Edition, Ipswich, MA. Accessed March 21, 2016. 2. Chauhan N. Chronic neurodegenerative consequences of traumatic brain injury. Restorative Neurology & Neuroscience [serial online]. March 2014;32(2):337-365. Available from: Academic Search Alumni Edition, Ipswich, MA. Accessed March 22, 2016. 3. Cheng G, Kong R, Zhang L, Zhang J. Mitochondria in traumatic brain injury and mitochondrial-targeted multipotential therapeutic strategies. British Journal Of Pharmacology [serial online]. October 15, 2012;167(4):699-719. Available from: Academic Search Alumni Edition, Ipswich, MA. Accessed March 23, 2016. 4. Schoknecht K, Shalev H. Blood-brain barrier dysfunction in brain diseases: Clinical experience. Epilepsia (Series 4) [serial online]. November 2, 2012;53:7-13. Available from: Academic Search Alumni Edition, Ipswich, MA. Accessed April 7, 2016. 5. Greve M, Zink B. Pathophysiology of Traumatic Brain Injury. Mount Sinai Journal Of Medicine [serial online]. April 2009;76(2):97-104. Available from: Academic Search Alumni Edition, Ipswich, MA. Accessed March 31, 2016. 6. Reyst, Heidi. 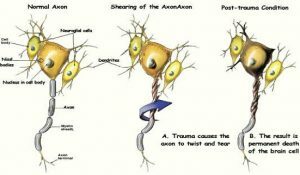 Neuroplasticity After Acquired Brain Injury. Rainbow Rehabilitation Centers. Availible at: http://www.rainbowrehab.com/neuroplasticity-aquired-brain-injury/. Accessed April 25, 2016. 7. Walker K, Tesco G. Molecular mechanisms of cognitive dysfunction following traumatic brain injury. Frontiers in Aging Neuroscience [serial online]. July 9, 2013;5(29). Doi:10.3389/fnagi.2013.00029. 8. Angoa-Pérez M, Kane M, Briggs D, Herrera-Mundo N, Viano D, Kuhn D. Animal models of sports-related head injury: bridging the gap between pre-clinical research and clinical reality. Journal Of Neurochemistry [serial online]. June 15, 2014;129(6):916-931. Available from: Academic Search Alumni Edition, Ipswich, MA. Accessed March 22, 2016. 9. Fornito A, Zalesky A, Breakspear M. The connectomics of brain disorders. Nature Reviews Neuroscience [serial online]. March 2015;16(3):159-172. Available from: Academic Search Alumni Edition, Ipswich, MA. Accessed April 5, 2016. 10. Palmer A. The Role of the Blood Brain Barrier in Neurodegenerative Disorders and their Treatment. Journal Of Alzheimer’s Disease [serial online]. April 11, 2011;24(4):643-656. Available from: Academic Search Alumni Edition, Ipswich, MA. Accessed April 7, 2016. 11. Prochnow N. Relevance of gap junctions and large pore channels in traumatic brain injury. Frontiers In Physiology [serial online]. February 2014;4/5:1-8. Available from: Academic Search Alumni Edition, Ipswich, MA. Accessed March 23, 2016. 12. Abbott N, Friedman A. Overview and introduction: The blood-brain barrier in health and disease. Epilepsia (Series 4) [serial online]. November 2, 2012;53:1-6. Available from: Academic Search Alumni Edition, Ipswich, MA. Accessed April 7, 2016. 13. Laskowitz D, Grant G. Translational Research in Traumatic Brain Injury. Boca Raton, FL: CRC Press / Taylor and Francis Group; 2016. 14. Springer J. Apoptotic Cell Death Following Traumatic Injury to the Central Nervous System. Journal of Biochemistry and Molecular Biology. 2002;35(1):94-105. 15. Mayer C, Huber B, Peskind E. Traumatic Brain Injury, Neuroinflammation, and Post-Traumatic Headaches. Headache: The Journal Of Head & Face Pain [serial online]. October 2013;53(9):1523-1530. Available from: Academic Search Alumni Edition, Ipswich, MA. Accessed March 21, 2016. 16. MacGregor D, Avshalumov M, Rice M. Brain edema induced by in vitro ischemia: causal factors and neuroprotection. Journal Of Neurochemistry [serial online]. June 15, 2003;85(6):1402-1411. Available from: Academic Search Alumni Edition, Ipswich, MA. Accessed March 31, 2016.